This might seem like huge privilege, the idea that I grew up in a lap of luxury. Nothing could be further from the truth. We grew up on a 70s estate, a three bedroom semi-detached. The reason I learnt to cook was that both my parents did. When we were lacking in readies, as we say here in Liverpool, the farm shop probably was one of the reasons we were still able to eat plenty of fruit and vegetables. Claremont Farm is now pretty well known. This summer I worked on its food, drink and music festival, Farm Feast, and got a strange delight hearing people talk about this farm that was so important to us growing up. It’s old barn farm shop has been replaced by a chalet style purpose built cafe and shop with local butchers. It is a Good Food Hub for Wirral. Everyone should have one. The farm (it was never Claremont when we were little, simply ‘The Farm’) taught me about growing food. It taught me about how food is grown by people who need to sell it. I knew the potatoes we picked up had been grown only a hundred yards or so from where I was handing over money. Around my birthday every year the Pick Your Own fields would open. Claremont is one of the last remaining Pick Your Own’s on Merseyside. The smell was delicious, and is still summertime for me, as I tried to assemble the flimsy plastic bucket and head into the fields to pick strawberries (and eat as many as I could). One summer we picked loganberries. My nan knew them, I’d never heard of them. She delighted in a farm with fresh produce on the doorstep and made us faithfully promise never to stop buying our fruit and vegetables there. Once you stop using it they go, you see. I learnt about seasonal vegetables. I knew when it was asparagus season, about what fruit you can expect when. As I got older I learnt about dairy farmers and chicken farmers, struggling against supermarkets and consumers looking for a quick and easy solution. I learnt that there is a direct relationship between the food you serve for dinner in the evening and the local economy around you. You can make a choice. Claremont Farm never was, or is, wildly expensive. Sure, OK it’s more than a supermarket but that’s not a bad thing. Everyone who sells their wares in the store gets a fair cut. It stocks local producers so you know that everything you buy goes straight back into the local economy. 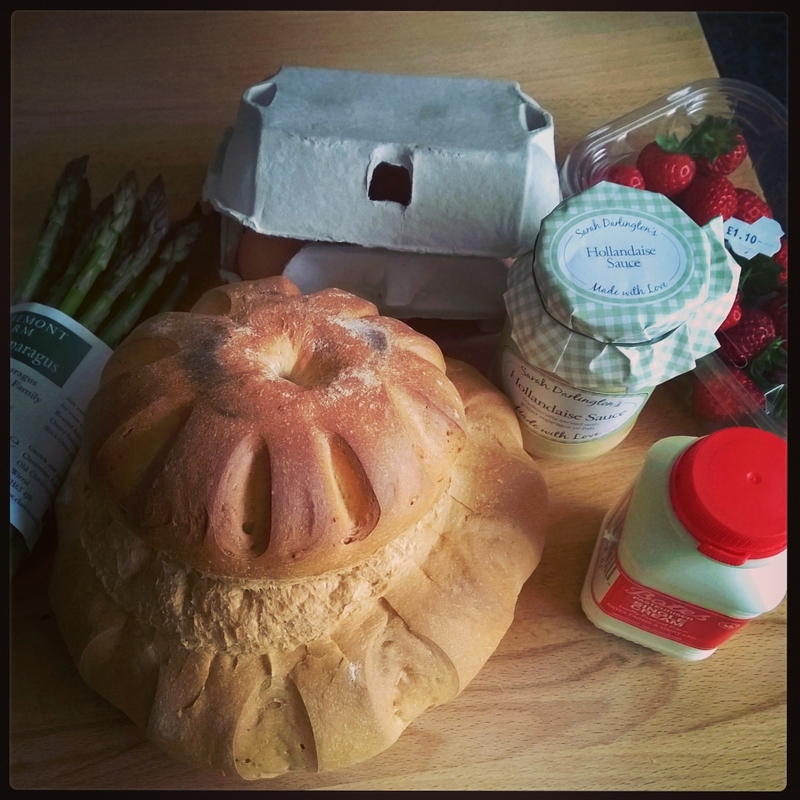 This bundle pictured above cost just under £10 and made four meals of toasted eggs with asparagus and hollandaise sauce, egg and bacon sandwiches, asparagus salad and eggs Benedict along with strawberries and cream for the weekend. Of course it was a treat but from the butcher, the baker, the sauce maker and the farmer everything I made with that bundle was produced within ten miles of my home. The disconnect we have with what we serve on our plates and where it comes from is at the root of our food and obesity problems. We don’t know what we eat. It’s as simple as that. Eating locally sourced, healthy food shouldn’t be a lifestyle choice, it should be the norm, like it was when our parents were children. We say we can’t afford it. We could afford it in the 80s when we had no money. My nan could afford to do it in the 50s, 60s and 70s when they had only one income and four mouths. We are the richest we have ever been, yet we say not only can we afford to when our poorer relatives did in the past but we say we can’t afford to subsidise food producers who’ve lived through more impoverished circumstances than the one we live in today. We saw we’re too time poor, yet chalk up views of boxsets and soap operas. It’s 40 years since Susan George wrote “How the Other Half Dies: The Real Reasons for World Hunger” and in that time our relationship with food has worsened. We convince ourselves we can’t commit to cooking, that we can’t afford to buy ingredients, that we can’t cook meals from scratch, that it’s a luxury. It isn’t. We are lying to ourselves, disrepecting those who genuinely can’t afford to eat and playing into the hands of a food industry that wants us to be as passive as possible. We are complicit. Good Food Hubs like Claremont Farm force us to make the connection between the places we buy our food from and the people that make them. A little effort is all it takes to change our habits. More Good Food Hubs and more of us will have an alternative about where we source and how we understand our food but will also force us to reconnect what we put on our plates and what we do to our local economies; we cannot have one without the other. (Listen to the excellent Susan George on The Food Programme here).